Welcome to Day #2 of Chocolate and Dark Blends Theme Week. 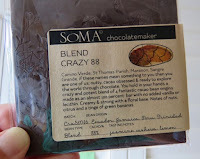 Today's Blend Crazy 88 bar was crafted by SOMA Chocolatemaker (Toronto, ON, Canada) using a blend of cacao beans from 5 different origins: Venezuela, Ecuador, Jamaica, Peru, and Java. The resulting chocolate was a smooth blend of beans with a sweet, pleasing rich chocolate aroma and a very light spice and fruit note. The makers honored this five origin bar by making this chocolate "almost as a 100% bar, with no added vanilla or lecithin," and that enabled a more pure tasting experience. The tasting notes for this dairy-free, dark chocolate, vegan, award-winning* bar suggested: "nuts, citrus, a tingle of green bananas," and that the chocolate was "creamy and strong with a floral base." 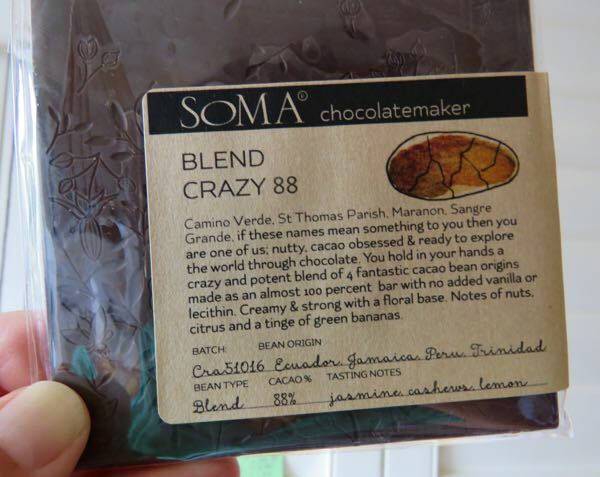 SOMA has great designs imprinted on their bars. 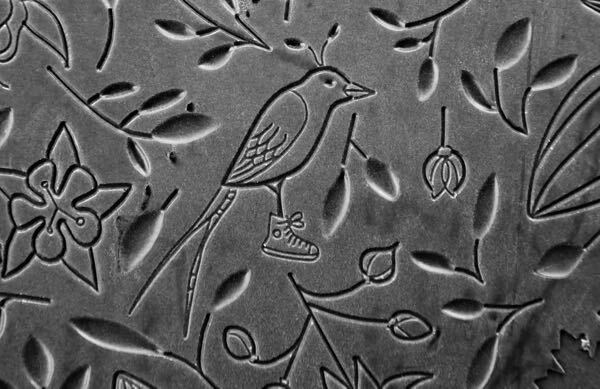 I imagined the collection of chocolate hieroglyphics (cacao flower, cacao pod, exotic bird with high-top tennis shoe, Canadian Maple leaf, etc.) being carved into stone, and being unearthed hundreds of years from now. What will they make of our veneration of chocolate?